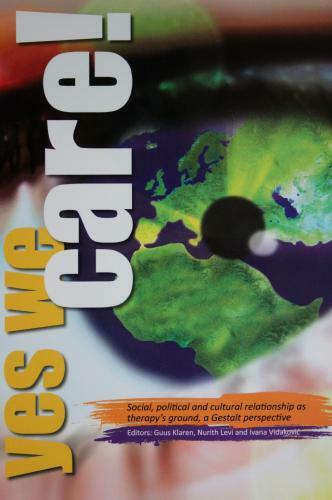 During the conference in Krakow last September the Human Rights and Social Responsibility Committee (HR&SRC) presented the book; ‘Yes we care!’ Social, political and cultural relationship as therapy’s ground, a Gestalt perspective. This book explores how human rights and social responsibility are inextricably contained in the theory and practice of Gestalt therapy. In the tradition of Paul Goodman, one of the founders of Gestalt therapy, the articles offer examples of what it means when a therapist’s focus extends and moves from the clinical work in the therapy room to social engagement in a broader context. The impetus for compiling these articles to form a book was the conference ‘Social, political and cultural relationships as therapy’s ground’ that took place in Venice (Italy) in October 2011, organized by the Human Rights and Social Responsibility Committee of the European Association of Gestalt Therapy. This book contains contributions from a selection of colourful international presenters who participated in this conference: Gestalt therapists, trainers of Gestalt training institutes and authorities outside the Gestalt community in the field of human rights and social issues. With this mix of presenters, a fascinating background was created against which Gestalt therapists perform their work. The articles vividly display some of the unique traits of Gestalt therapy that are deeply inspired by and committed to the reciprocal relationship of a person and his or her environment. This essential book is meant to encourage professionals who care for human societies at heart in their activities. The book is available by sending an email to the office manager of EAGT eagtoffice@planet.nl indicating the number of copies, your name and shipping address. After receipt of your payment (which can be done by bank transfer or through PayPal which is linked to our website http://www.eagt.org/membership.htm) we will send you the book(s). We hope it inspires and encourages you in your active involvement in the field of human rights and social responsibility.